Hitting a bullseye seems so simple in words. All you must do is align the sights and hold them there while releasing the sear of the handgun and allowing it to fire. Shooting is an art. Like all art, the actual doing is so much more intricate than words can describe. All to often, it is not what you do, but what you do not do that gets that bullet on the mark. Here's a chart to help you figure out what you may need to stop doing. 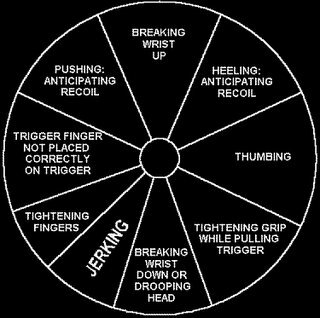 This chart is set up for the right handed shooter. Left handed shooters simply use a mirror image of the chart. At what distance should you shoot this chart from? at NO distance. You should shoot or use OTHER targets, and then use this as a reference to see what you are doing wrong. You could shoot this as a target I guess, but then you better print a bunch of them to use all the time. This is basically just a reference chart. Here is a link if you would like to print some off in full size. Do not shoot this. It is for reference only. You shoot at other targets, and then use this to see what you are doing wrong. Here is a better site to print off on full size paper. Guy taught me once ... course he didn't have all this fancy wheel stuff, which I think is pretty neat. He had a revolver that could be dry-fired without harm. (Don't ask me what model) and we did the "Russian roulette" method to measure (I never did "emlimiate" it) my flinch. Just aim and shoot as you would normally after spinning the cylinder (without cheating). Works pretty good and you see yourself very clearly when there is no round and you expect one. With the aid of video, you can watch yourself even more closely. PS - Anon said it well!!! Too often we (at least me) raise the weapon and then lower it on the target to get the sight picture ... you know ... like Dirty Harry would do. *klaxon sound* WRONG! Anon's example is great!